Synods: the recent extraordinary assembly and the ordinary assembly scheduled for next October. 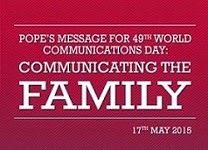 So I thought it appropriate that the theme for the next World Communications Day should have the family as its point of reference. After all, it is in the context of the family that we first learn how to communicate. Focusing on this context can help to make our communication more authentic and humane, while helping us to view the family in a new perspective. sound of the mother’s heartbeat. This encounter between two persons, so intimately related while still distinct from each other, an encounter so full of promise, is our first experience of communication. It is an experience which we all share, since each of us was born of a mother. Even after we have come into the world, in some sense we are still in a “womb”, which is the family. A womb made up of various interrelated persons: the family is “where we learn to live withothers despite our differences” (Evangelii Gaudium, 66). Notwithstanding the differences of gender and age between them, family members accept one another because there is a bond between them. The wider the range of these relationships and the greater the differences of age, the richer will be our living environment. It is this bond which is at the root of language, which in turn strengthens the bond. We do not create our language; we can use it because we have received it. dimension of communication, which in the case of Christianity is permeated with love, the love that God bestows upon us and which we then offer to others. life and communion, giving comfort and hope to more fragile families, and thus build up the Church herself, which is the family of families. 2others, to speak respectfully and to express his or her view without negating that of others, will be a force for dialogue and reconciliation in society. parishes and associations to become more welcoming and inclusive of everyone. the spiral of evil, show that goodness is always possible, and educate our children to fellowship. of the human person and service of the common good. how to generate and consume information. The latter is a tendency which our important and influential modern communications media can encourage. Information is important, but it is not enough. All too often things get simplified, different positions and viewpoints are pitted against one another, and people are invited to take sides, rather than to see things as a whole. an institution in crisis. At times the media can tend to present the family as a kind of abstract model which has to be accepted or rejected, defended or attacked, rather than as a living reality. that our lives are bound together as a single reality, that our voices are many, and that each is unique. actively communicate by their witness the beauty and the richness of the relationship between man and woman, and between parents and children. We are not fighting to defend the past.